The 6 pointer! Are these a common site? What a beast! Rutting? Did you have to stalk in order to get closer, James? Thanks Paul ! 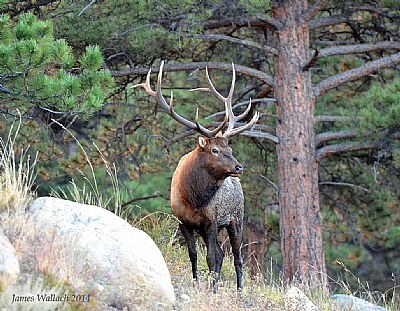 Moraine Park is a popular area for elk herds in the fall, during the rut. This guy was a little ways off the meadow, i was darn lucky to come across him while hiking back to the valley. Sreeradah, I haden't noticed the little smirk ! Thanks for that ! Much appreciated Clay ! The Elk and I only had about 15 seconds together before he wandered off, an amazing moment in time. congratulations.looks like it's smiling impishly!best regards. An amazing wildlife shot James. Definitely should be an award winner.